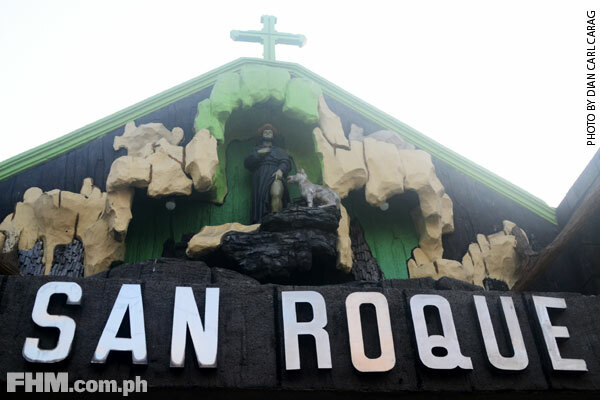 This is San Roque Chapel in Honorado Lopez Boulevard, in Tondo, Manila. On Good Friday, hundreds of people—neighbors, tourists, journalists—will come here before dawn to bear witness to a punishing procession of faith, forgiveness, and pain. The procession—usually in two batches: one for masked penitents aged 30 and up; the other for guys 18 to 29 years old—begins at 5 a.m with the older set. When their seniors return to San Roque Chapel at 9 a.m., the young'uns take off and come back at 12 noon. It's held around certain parts of Balut, Tondo. Throughout the ritual, these brave participants will flog themselves in public with a bulyos, a whip made of bamboo sticks. Prior to the procession, organizers inflict minor wounds on the flagellants' backs either by using a blade or broken glass. When hit, these wounds will bleed easily, making the penitent's unpleasant experience all the more bloody, distressing, and gory. They do this because they want to reenact the suffering Jesus had gone through—at least a fraction of it. One doesn't need to head down to Pampanga (Cutud) to witness a real-life The Passion of the Christ. 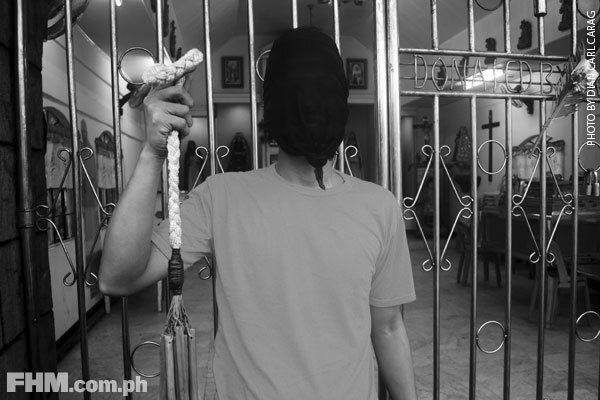 While the Manila version rarely involves actual crucifixion, the amount of self-harm these masked flagellants endure in this powerful display of sacrifice will leave casual observers shocked. 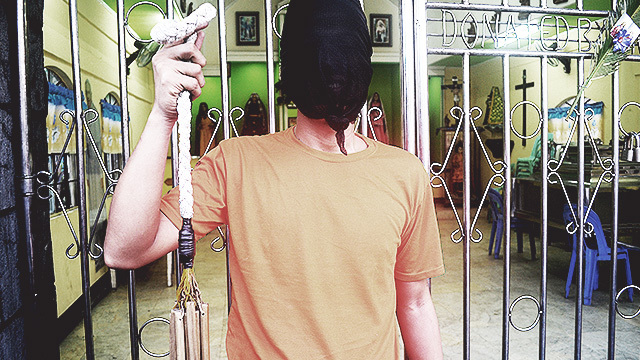 Often criticized for their supposedly mindless ritual, penitents not only have the physical and psychological torture to bear, but also the social stigma that comes with their panata. Behind the camera flashes and rising tourism figures, the affair still is a largely frowned-upon part of Filipino culture. The Catholic Bishops' Conference of the Philippines had repeatedly called the practice inappropriate in the past. To understand fully why these people keep on doing this despite the warnings, one has to go inside the mind of one of them. FHM did just that. RJ Villavicencio, 24, has been at it for eight years now. "Simula po nung nagsama kami ng asawa ko, nung pinasok ko yung pagpapamilya," he tells us. RJ does this so God will continue to protect his family from illnesses, harm, and evil spirits. But there are those, he adds, who join the annual tradition just for the heck of it. For his part, though, he is fully motivated by his faith. "Nung una, nagdadalawang-isip ako. Pero nung pumayag na yung magulang ko na mag-asawa ko, diniretso ko na, wala nang patumpik-tumpik." More than the physical conditioning, a lot goes through his mind days before enduring a spiritual bout through self-flagellation. First, seek atonement for the sins he and his loved ones have committed. In turn, he forgives those who did him wrong, "kasi hindi naman ako patatawarin kung hindi ako marunong magpatawad." As cliché as it sounds, he even prays for his enemies, that they could settle their differences. "Ang Diyos nga nagpapatawad, ako pa kaya?" Noble as his intentions may seem, RJ admits that until now, his family—especially is wife—still feels uncomfortable of his panata. "Hindi mawawala yung lumuluha (siya)," he shares. "Kasi hindi siya sanay na makita akong ganun—nadadapa, pinapalo. Hindi ko naman siya pinapupunta pero pumupunta siya. Gusto niyang makita kung ano'ng ginagawa ko." The moment he sets foot in the procession, however, RJ becomes so engrossed with what he's doing that he enters a state of detachment from the outside world. "Pag nandoon na 'ko sa aktwal, hindi na 'ko makakausap. Kasi oras ko na yun eh, para sa'ming dalawa (him and the Lord) yun eh. Ako na yung lumalapit sa Kanya, kaya isinasantabi ko lahat ang nakikita ko, pino-focus ko sarili ko sa ginagawa ko. Sineseryoso ko yung ginagawa ko." This he does amidst a few raised eyebrows. RJ continues to receive strong opposition over what he's getting himself into, to the point of being asked, "Yung ginawa ni Hesukristo, ba't ginagawa mo?" If anything, he recognizes the difference between what the Son of God went through, its significance, and his panata. RJ recalls his first time joining the yearly spectacle; he almost gave up because he couldn't stand the pain that it entailed. "Kasi sumalang ako tanghaling tapat eh. Mainit. Papaltusin yung paa mo, at yung tuhod mo pag lumuhod ka. (Yung lupa) sobrang init, babasain pa, lalong umiinit. Nagkakanda-paltos-paltos, tapos pasa—mahirap." What kept him going, though, was his love for his family. "Hindi mo na iintindihin yung sarili mong hirap." Did he feel even a tad of regret in embracing the heavily criticized practice? "Wala ho," he says convincingly. "Kasi nung nagsimula ako, siguradung-sigurado ako. Kung ilang taon na kaming magkasama ng pamilya at asawa ko, ganu'n na ko katagal nag-ga-ganito. Kaya kung pagsisisihan ko rin 'to, parang pinagsisihan ko na rin ang pamilya ko." 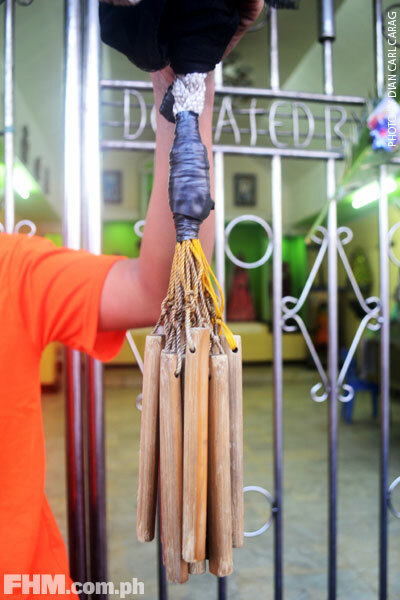 Usually, the number of bamboo sticks at the end of the bulyos indicates the years a penitent will take part in the religious undertaking. But RJ is willing to grow old flogging himself himself until he could take no more. It usually takes three days for the wounds he sustained to heal—most of the time even without proper medication, RJ relates. "Halimbawa ngayon nagpenitensya ako, kinabukasan langib na siya, babakbakin ko na isa-isa yan," he shares. "Kung hindi na dumudugo, peklat na siya. Kasi ang pinanunugat dito bubog, kaya pag bagong sugat lang kami, makikita ninyo yung buka." As far as injuries and more severe repercussions are concerned, RJ puts his faith solely in The One Above. "Handa naman ako sa lahat ng pwedeng mangyari sa'kin habang ako'y namamanata. Pero, malakas ang pananalig ko kaya… Nagtitiwala ako sa Kanya na hindi Niya ako hahayaang madisgrasya." Especially now that he feels the stars are beginning to align for him and his family, it looks like he's not keen on laying off the whip just yet.